Deep frying a turkey, let alone making a marijuana deep fried turkey, may sound like a strange concept. Trust me, it doesn’t come out like you’d think. Deep fried turkey is moist and delicious and not at all greasy. 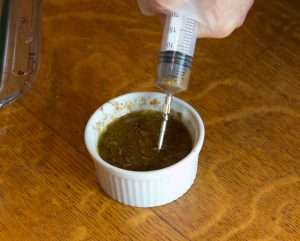 And my injectable marijuana turkey marinade recipes (see below) are so flavorful, you’ll never notice the taste of the cannabis! It’s no surprise that fried turkey originated in the American south, arguably the frying capital of the world, but it is a culinary trend that’s caught on nationwide. And fried turkey is not just for Thanksgiving. It’s quick to fix (you can estimate on about three minutes per pound to cook), feeds a crowd, and it always a sure fire hit, with or without the addition of cannabis! A recent summertime block party I attended in South Central Los Angeles had three fried turkeys going at once! 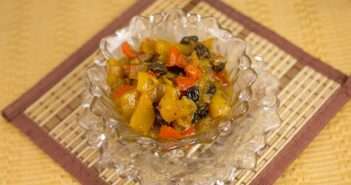 Several groups of neighbors had gotten together and split the cost of the oil and special equipment needed to make this dish. Inexpensive meat injector from the dollar store. 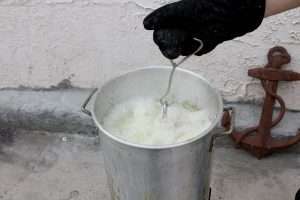 Turkey — smaller birds work better for frying. Try not to go over 15 pounds. 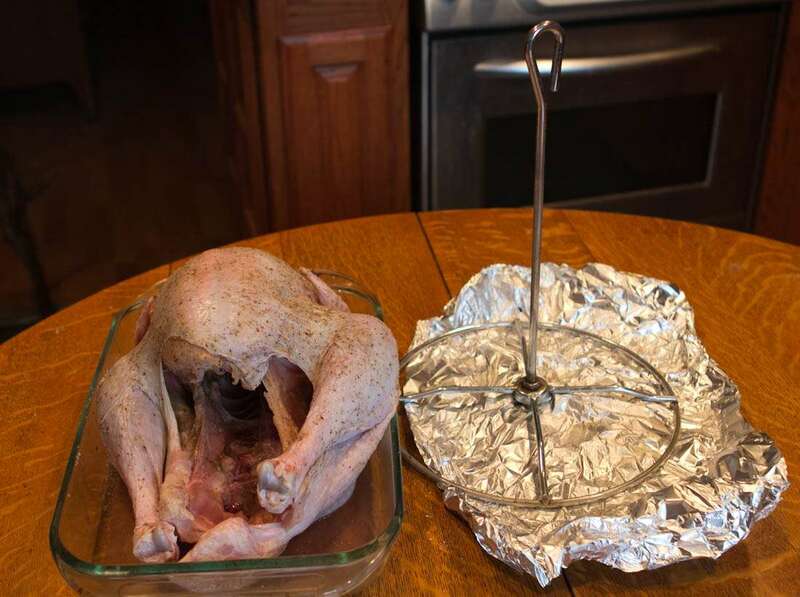 An outdoor turkey frying set-up. These are available in stores everywhere in the fall, or anytime online. This includes a 40 or 60 quart pot with basket or turkey frying hardware, plus a heavy duty propane burner. About 5 gallons of oil (go to a restaurant supply or warehouse store for the best price). Use oils that have a high smoke point, such as corn, peanut or canola oils. Heavy duty BBQ style oven mitts. Injector to add marijuana medicated marinades to the turkey. You can often find cheap plastic marinade injectors at the dollar store. They work just fine if you are careful with them and only plan to make this dish once or twice (I always buy an extra in case one breaks, they’re only a buck.) If you are a turkey fiend and plan to make fried turkey and other marinated meats (BBQ season is soon upon us) check out the meat injectors at Amazon.com or your local gourmet shop for one that will last. Fire extinguisher. Just in case, as the hot oil is extremely flammable. NEVER pour water on an oil fire! 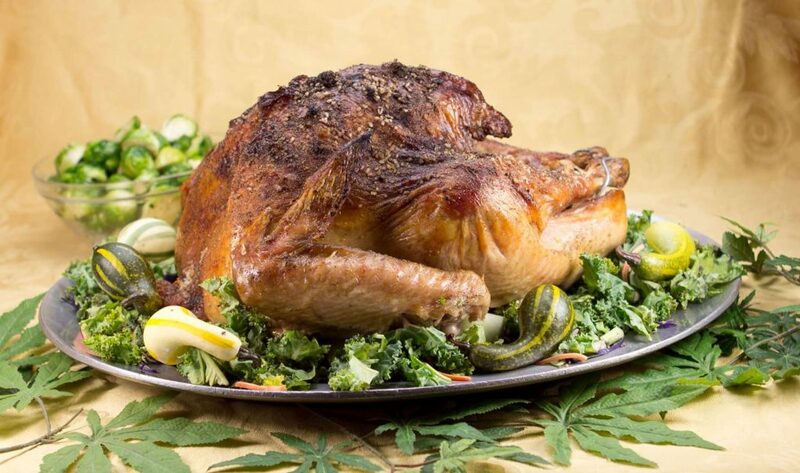 Marijuana Deep Fried Turkey: Infusing the bird with flavor and cannabis. An injector, which resembles a large hypodermic needle, allows you to inject a marinade directly into the meat. This allows the flavor from the marinade to actually get INTO the meat instead of just sit on the surface. In the case of a Marijuana Turkey, it’s also how we will infuse the meat with cannabis. I tried many of the injector needles on the market. The heavy duty stainless steel ones are great, but pricey of frying turkeys and BBQing meats is not a regular thing for you. The dollar store and most grocery stores, however, carry cheap plastic syringes with injection needles this time of year. In my experience, the plastic models work just fine for one or two uses, just be a little careful as they are more fragile. Fill your syringe with marinade and inject it into both sides of the breast, the legs and the thighs of the turkey. Don’t be afraid to move the needle around to get the marinade different parts of the bird. Think of how the dentist injects novacaine, he goes in at one spot then moves the needle around to get to different areas. 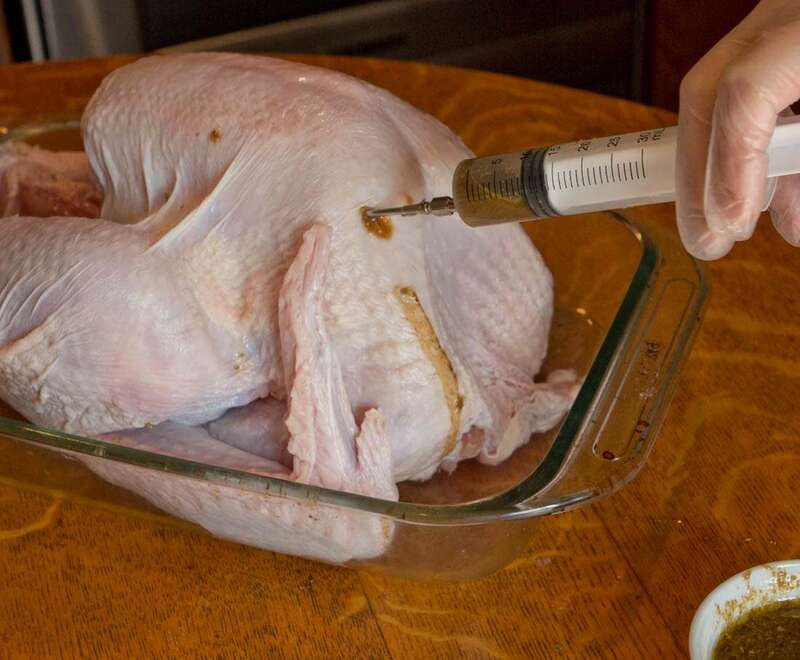 This is exactly what you want to do when injecting the turkey with marinade. Sometimes it’s easier to get the thighs and other areas from the inside of the cavity. Use as much marinade as the bird will hold. You’ll know when it starts leaking out all over that you have enough. Because so much oil is flammable, you should never fry a turkey indoors! Place the fryer, outdoors, on a level dirt or grassy area. Avoid frying on wood decks, which could catch fire. You will also want to avoid concrete surfaces, unless you don’t mind oil stains. Always keep a fire extinguisher nearby. WAIT! Before You Fry Determine How Much Oil You Need! This turkey fryer shows the proper oil levels on the pot. Place the raw turkey (it can even still be in the wrapper) in the pot. Add water until it reaches about two inches above the turkey. Add water until it is about 2 inches above the turkey. 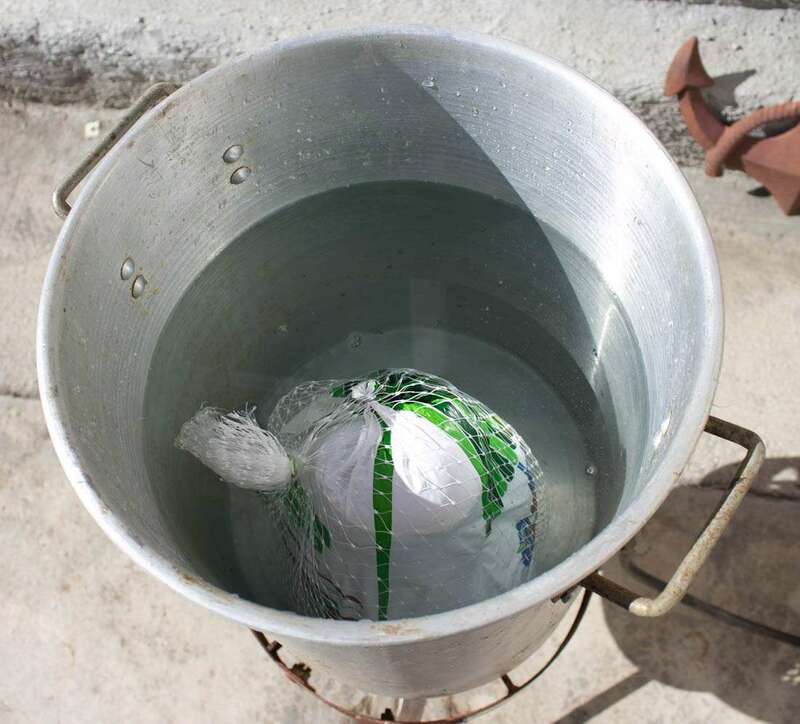 Remove the turkey and note the water level by using a ruler to measure the distance from the top of the pot to the surface of the water. 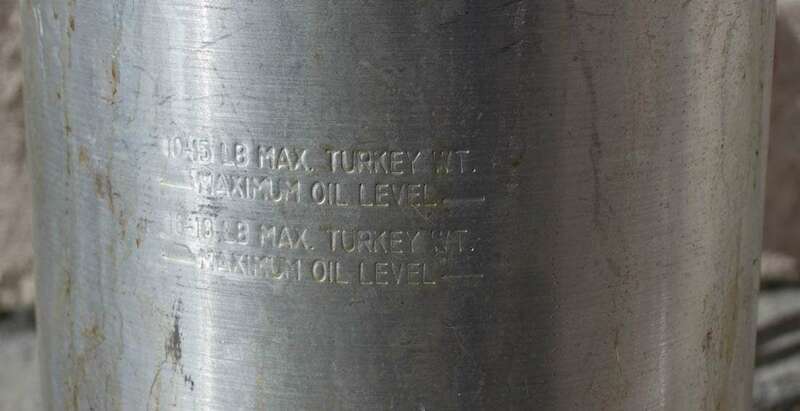 This is the amount of oil you will need to fry your turkey. 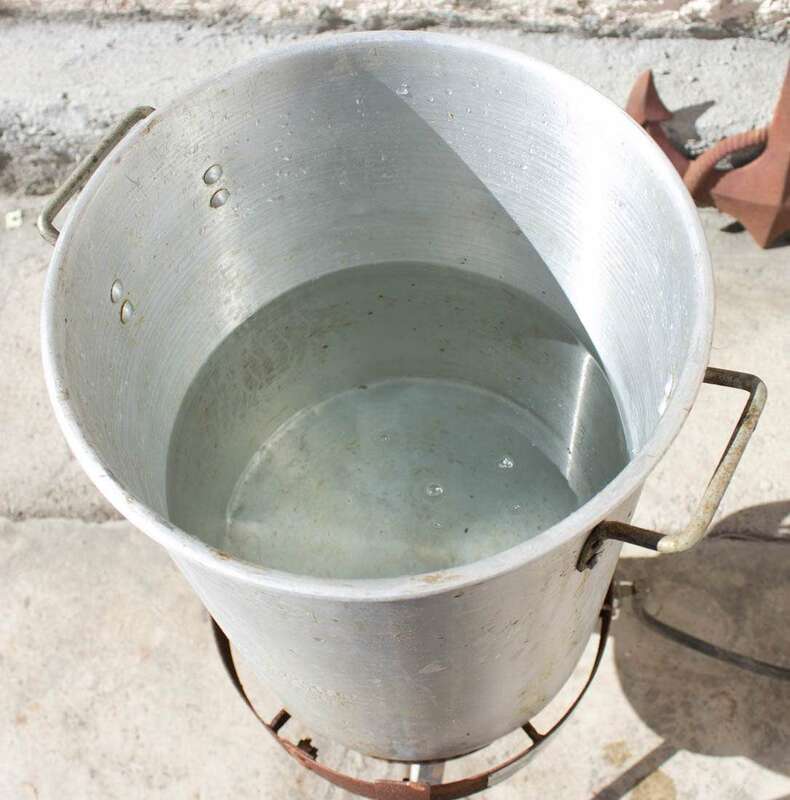 Remove the water and thoroughly dry the pot. 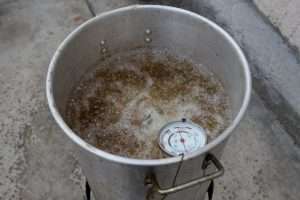 Add enough oil to equal what the water level was without the turkey in the pot and you are ready to fry! Make a note of the water level after removing the turkey, this is how much oil you will need. 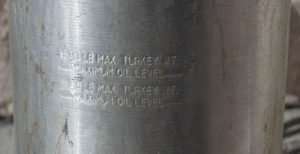 Determine the amount of oil needed: See above for details. Prepare the turkey: Remove neck and giblets from the cavity and reserve for another purpose. (I usually add the neck to my stock making stash and my dog enjoys a giblet dinner, but that’s me). Also be sure any plastic is removed from the turkey before frying! Some companies use a metal to bind the turkey legs together and this is fine, but some use plastic and this is not. Hot oil would melt that toxic plastic as soon as the bird hits the fryer, so pry that plastic out! Infuse the turkey: Make one of the Marijuana Infused Injectable Turkey Marinades: Lemon HERB Marinade, Cajun Marinade, or BBQ Marinade. Use a meat injector (see above) to infuse the marinade throughout the bird. 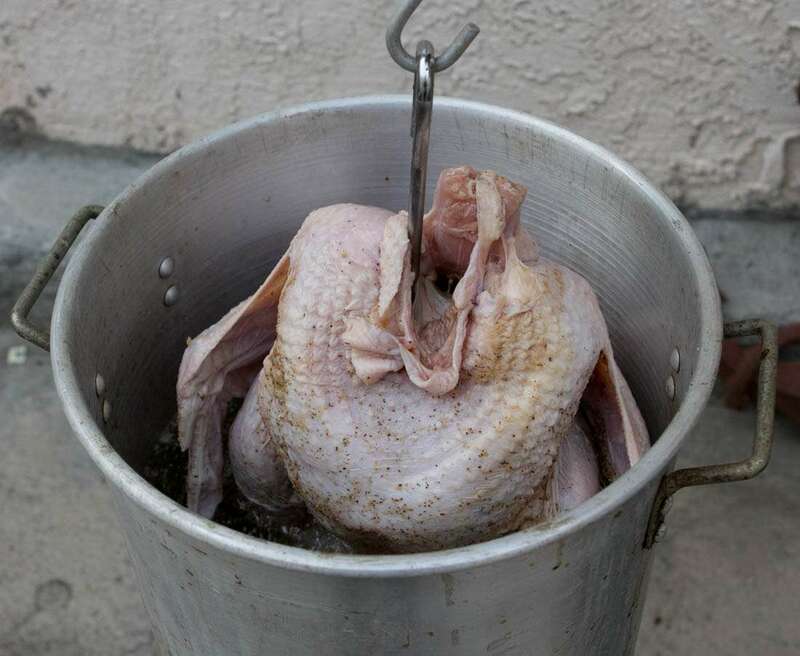 Put Turkey on the rack or in the basket: Different turkey fryers have different ways of holding the bird in place. Some will have a basket, others, like mine, have a stand the turkey fits over (sort of like a large beer can chicken without the can). Now is the time to ready your turkey in whatever hardware you are using. This is the apparatus for frying the turkey that I use. Here is the turkey on the frying stand, ready to go into the hot oil. Heat the oil: Using a long probe candy or deep fry thermometer to determine temperature, heat the oil to about 325°F and no higher than 350°F. 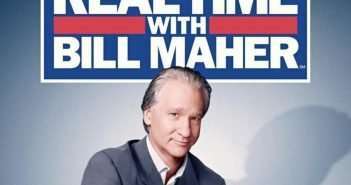 This usually takes between 20 to 30 minutes. Fry the turkey: Once the oil is hot enough, place the turkey in the basket or on the turkey hanger (follow instructions that came with your turkey frying kit) and slowly lower it into the pot. Now let her fry. With whole turkeys, you can estimate on about three minutes per pound to cook. Remove turkey and check the temperature with a meat thermometer. The temperature should reach 170° F. in the breast and 180° F. in the thigh. Carefully lower the infused turkey into the hot oil. Use caution and move slowly! The hot oil will bubble up when the turkey goes in. Fry the turkey for about 3 minutes per pound. Do not stuff turkeys you plan on frying, it just doesn’t work and food safety issues come into play..
Be sure to measure for the amount of oil you’ll need BEFORE you marinate the turkey. Immediately wash hands, utensils, equipment and surfaces that have come in contact with raw turkey to avoid cross contamination. Keep an eye on the time, fried turkeys cook quickly. It only takes about 3 minutes per pound. Overcooking is one of the biggest mistakes beginners make. I should know, I cooked my first fried turkey so much the outside was charred completely black. Surprisingly, the meat inside the burnt shell was still delicious, so know that if you make this mistake, all may not be lost. 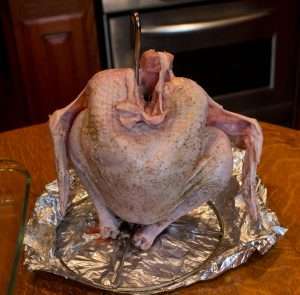 Let turkey rest for 10 minutes before carving. Store leftovers in the refrigerator within two hours of cooking. Never leave the hot oil unattended. Don’t allow children or pets near the cooking area. Allow oil to cool completely before disposing or storing it.